April 3, 2011 - As China looks to open up its low altitude airspace in the coming years, Eurocopter is well-positioned to cater to an expected growth in demand for helicopters, which will become a vital complement to business jets for corporate and VIP air transport. Not only does Eurocopter offer the widest range of products available in business aviation and VIP configuration, it also has “designer helicopters” specially produced in collaboration with top luxury designer brands that will appeal to China’s elites for air travel in the utmost comfort and style. At the second annual Hainan Rendez-Vous event held April 1-4 2011 that celebrates luxury living, world’s leading helicopter manufacturer, Eurocopter, will showcase its strength in the business aviation and private segment with two models on display – a scale 1/10 mock-up of the EC145 Mercedes-Benz Style at stand D26 and a EC135 on static display at Visun Marina. Exhibiting alongside Airbus, Eurocopter aims to highlight the important role of helicopters as a vital complement to business jets by being the ideal “first mile, last mile” solution. Bruno Boulnois, CEO of Eurocopter China, sees huge potential in corporate air transport due to the country’s vast territory and dense population, “Be it for business or leisure, few can afford to waste precious time for travel in today’s world. The flexibility offered by helicopters in take-off and landing is an extremely attractive proposition, and provides that crucial missing link in endto- end transport solution. “China’s impending airspace reform will facilitate the development of the business aviation sector, which will see pent-up demand for such products and services being quickly addressed by established companies like Eurocopter. Our helicopters are renowned the world over for its state-of-the-art technology and luxurious interior that is ergonomically designed to provide a well-equipped in-flight office for the ultimate comfort of business travelers,” adds Boulnois. Eurocopter has always been committed to the business aviation market with constant innovation and enhancement made to its fleet to meet the needs of its corporate customers. It offers the widest product range comprising 12 different model types – from light single-engine, light and medium twin-engine, to heavy twin-engine, that can seat from four to 19 passengers in the VIP configuration – hence catering to a wide base of customers from private owners, small and medium enterprises, to multi-national corporations. The light, single-engine helicopter range comprising EC120, EC130, AS350 B2 and AS350 B3, can seat up to between four and seven passengers, with spacious cabin room and great visibility being some of the much-appreciated features in such light aircrafts. The light and medium twinengined AS355 NP, EC135, EC145, AS365 N3 and EC155, have proven to be very popular for passenger transport and offshore missions due to its power, state-of-the-art technology and cost efficiency, with the ability to carry up to 12 passengers comfortably in the EC155 which incidentally is also the quietest helicopter in its class. The Super Puma range comprising AS332 and EC225 are in a class of its own in the heavy twin-engine category, having proven its superiority especially in high-altitude conditions, with a big seating capacity of up to 19 passengers. Not forgetting of course, the new medium twin-engine EC175/Z15 – a joint development between Eurocopter and China’s AVIC Group. With certifications planned for end 2011, the first delivery of this 16-seater, 7-ton class helicopter is expected in 2012. Trademark features of Eurocopter VIP-configured helicopters that have been such worldwide successes include the exceptionally spacious cabin, the large side-sliding doors for passengers’ easy access, the substantial luggage storage space loaded easily through the rear clamshell doors, the spectacular view from a generously windowed cabin, the low noise and vibration levels, as well as state-of-the-art technology that delivers outstanding performance in terms of range, speed, reliability and safety. In addition, Eurocopter also introduced the Stylence family of helicopters, where aesthetics, ergonomics and advanced technology were merged to provide the ultimate flying experience. Stylence – a combination of style and silence – incorporates extra-thick interior insulation and special flooring to further lower the noise and vibration levels, in-flight office and telecommunications equipment, and luxurious interior with high quality leather upholstery, making the ride truly relaxing and enjoyable. The Stylence package is offered on five different models currently – EC120, EC130, AS350 B2/B3, AS355 NP as well as EC145. To move with the times and recognizing an increasing demand for an even more unique travelling experience, Eurocopter has also collaborated with Hermès and Mercedes Benz, two of the world’s most renowned brands in fashion and automobile respectively, to create the EC135 Hermès version (known as L'Hélicoptère par Hermès) and the EC145 Mercedes-Benz Style. 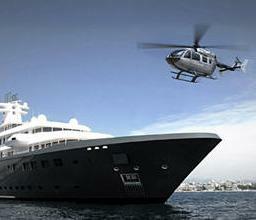 These two highly exclusive designer helicopters have been created specially for the discerning luxury travellers today. As the only helicopter manufacturer with a full-fledged subsidiary in China and having offices in Beijing, Shanghai, Shenzhen, Chengdu, Wuhan and Hong Kong, Eurocopter China is wellpositioned to cater to the growing needs of the corporate and VIP helicopter market. “Much like the anticipated growth in private yachts and business jets, the potential of business helicopters in China is huge. Once the low altitude airspace is opened up by the government, we estimate that there will be around 100 VIP helicopters flying in China’s airspace within the next 10 years,” concludes Boulnois.